I’m going to see The Maze Runner movie tomorrow, if nothing happens to make me change my mind between now and then. I haven’t read any of the books of the series, although I have The Maze Runner on my Kindle and I’ve been meaning to read it. We know how that goes! Coulda, shoulda, woulda, as they say. Why am I going to see this movie? Because I like the star. Dylan O’Brien is a stand-out actor in Teen Wolf (yeah, I know, but I love it) and I like science fiction and dystopian fiction. My daughter has been asking to go since we heard about the movie being made. What I’m worried about? 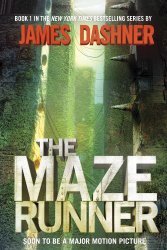 In the description of the movie on Amazon, there’s a quote from EW.com that compares The Maze Runner to Lord of the Flies, The Hunger Games, and Lost. There’s not a book or show in that list that I like. In fact, I despise Lord of the Flies, and I really didn’t like the bit of The Hunger Games I read and I thought the movie was only so-so. I watched one and a half episodes of Lost before giving up. I might get back to it, but after what I’ve heard about the ending of the series, I don’t know if I’ll ever overcome my reluctance to put that much time into the series for very little payoff. Seems unlikely. UPDATE: I actually did like this movie. I don’t think I want to wait a year or more just to get the answers to all those unanswered questions though, so I’ve added the books to my TBR pile. Next Next post: Early Start!